In recent years Tokyo's contemporary art scene has been thrust into the limelight, and names such as Takashi Murakami and Yayoi Kusama increasingly gather the world's attention. While Tokyo's vast array of exhibitions and art hubs can be difficult to navigate, there is one area that is not to be overlooked - that is Tennozu Isle. 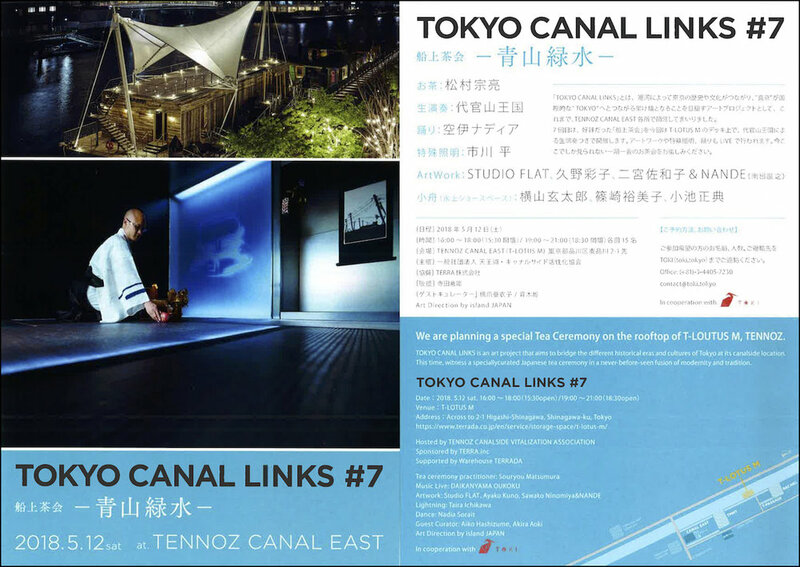 Located within walking distance of Shinagawa, the “isle” is characteristically surrounded by canals, connected by bridges, a train and a monorail that provides access to surrounding areas. Many buildings in the area are adorned with large-scale murals, adding color and energy to the increasingly trendy area. The laid back atmosphere makes it an attractive location to visit and relax while enjoying the sights and most of all - art. TERRADA's event space T-Lotus appears to be floating on the water. How did this area become known for art? Leading the movement you will find Warehouse TERRADA, but don't be deceived by its name. What began as a place to store wine, art, and media, Warehouse TERRADA has taken the concept to another level. Doing away with the “warehouse” feel, they have created an establishment that is chic, and while still serving its purpose as a secure place of storage for its clients, it also provides a place to congregate as well as a space for artists to develop their latest innovations. Warehouse TERADA, which not only runs its main gallery T-Art Gallery, also features rentable art studios in T-Art Kobo, working to support the up-and-coming artists of tomorrow. Pigment art lab and its beautifully designed interior. Unique tea ceremony at T-Lotus, where tea bowls are works of art. Art meets architecture on Tennozu Isle at Pigment, an art lab that boasts over 4,000 pigments, brushes of all sizes and shapes, and even artwork for sale. Aside from various art paraphernalia, the lab features specialists who lead art lectures on top of assisting customers. The lab’s interior was designed by world renowned architect Kengo Kuma (see exclusive TOKI interview), who also designed the 2020 Tokyo Olympic Stadium. As a center of creativity, Tennozu Isle is no stranger to hosting unique and collaborative events. One of TERRADA’s event spaces, known as T-Lotus, is scheduled to host a special tea ceremony on Saturday May 12, 2018 (see flyer below). The waterfront structure, which was designed under the supervision of Kuma, is meant to resemble a ship - consisting of a basement and a deck. This unique event will feature headmaster of the Ura school of tea ceremony Souryou Matsumura, artist Tomomi Matsuyama, dancer Nadia Sorait, and musical group Daikanyama Oukoku. Come out and enjoy this never-before-seen fusion of modernity and tradition, and explore the artistic wonders of Tennozu Isle!